The daylight comes earlier now, and at 5:30 it is peering through the windows. And with it comes a small black silhouette, poised politely at the bottom of the bed. Clive waits, a silent question. He is well mannered, and does not walk up and down Phil as if he were a public footpath, as our cantankerous old cat used to. He waits, like Jeeves, for a convenient moment to begin the day with breakfast. Our cats: each with his habits, each with her foibles, and each beloved in life, fondly eulogised by owners long after they have stalked off to bother someone in the afterlife. Today, I pottered up to London to see a house I have long wanted to visit: Dr Johnson’s house. It is one of a string of Small Historic Houses who have banded together to attract tourists. They are the Shh! Houses. Dr Johnson is my first. I shall be storming the houses of Handel, amd Benjamin Franklin, Freud, Wesley and Keats before long, I hope. But today it was the turn of the lexicographer: the larger-than-life celebrity in his own time, Dr Samuel Johnson. So, like me, he made do with battered old ones, and covered a great long table in his attic study with tomes to help him in his cataloguing of the English language. The house he used, in the City of London, was modest: tall, with two main rooms on each floor, bound together by a steep little staircase. There were entertaining rooms, utilitarian rooms, a kitchen, a dining room. There was a walk-in closet in the parlour used specifically for powdering Dr Johnson’s wig. There was a room for his favourite lady, and a room lined with cases and cases of books, almost none of them original, for all but three were auctioned off after Johnson’s death. But his attic, his work-room, hummed with activity. It is a light work-space with windows looking out over a city which has changed immeasurably since he sat there poring over definitions. His dictionary was filled with touches which showed his humour. It transpires, then, that Johnson liked cats very much indeed. And the greatest of all his cats was a black cat. Called Hodge. Hodge liked oysters, and used to sit enquiring silently, a feline question mark much like Clive. And rather than send his servant out on such a menial task, Dr Johnson would leave his work, and go out into the city to find oysters for his small friend. At that time oysters were not expensive delicacies, but food for the poor. But Hodge liked them, and Johnson was his oyster procurement officer. If you look out of the window of 17, Gough Square, you may not imediately see him. But look again, and across the square, where any cat might sit posing a polite oyster-based enquiry: there he is. The statue, a relatively recent addition, was created by English sculptor Jon Bickley in 1997. But somehow, it feels right to have Hodge sitting there after so long. Written in response to Side View’s weekend challenge: The Question, which you can find here. Posted in Literary lives, Places to visitBookmark the permalink. If you ever. And I mean EVER. Set foot in ths country, Sidey, I shall plan a dawdling day to die for, and we will trail from place to place feeling the atmosphere together. Wonderful set of pictures. Your trip on the Underground was certainly worth it. …and this was just the beginning, Roger! All those houses still waiting to be explored. What a lovely house albeit a bit clinical!! It is incredibly tidy, isn’t it?, Lisa I think Johnson kept it cluttered as a matter of honour, the top floor at least. But we are left to imagine the chaos. What? Would we catch something if we rested something on David Garrick’s chest, or would he come bounding after us? I sense a novel coming on, Wanderlust. What a wonderful picture that question paints! Great photos and history Kate! I like the name Hodge for a cat! It is almost as good as Spudley, Tom, though not quite. Lovely chap, isn’t he? Makes you want to leave him a glass of milk. Isn’t that just right? That Hodge still sits enquiring silently.. ? 😀 The house we stayed in recently at Lyme Regis was built in the same year Dr Johnson wrote his Dictionary. All refurbished but they kept the original Georgian features. A wonderful period. I would love an attic like Johnson’s, and its view out onto the City square. Great pics, the life of a cat is almost kingly. They do command reverence from their owners, don’t they, Lou? Hi Stina 🙂 Thank you, and Happy Spring to you too! 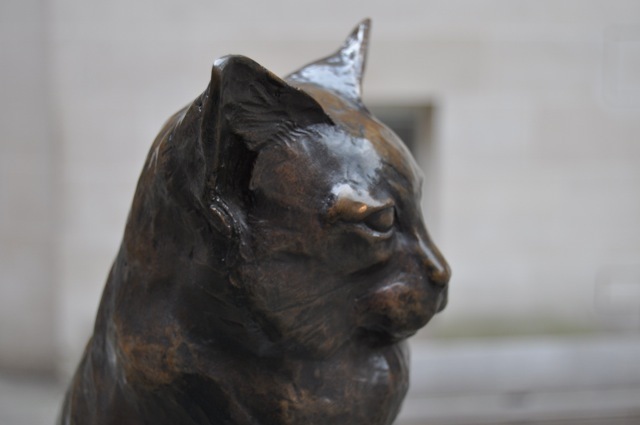 The sculptured cat looks as if he might jump up at any moment. He has a real presence. And that oyster! The Johnson house is beautiful. I’d like to work in that attic space. I keep saying things like “no cat is going to run my life,” as I continually cater to my moggie Maggie, adjusting window blinds so she cat sit on the sill, responding to her every real or imagined whim. I love the fact that Samuel Johnson would dash out to fetch oysters for Hodge. How do cats manage to command humans? How I love cats! Hodge and Clive are patient types. Mine, vociferous and demanding. No quiet waiting for my attention. Pet me … now! Feed me … now! Or I will annoy you in every conceivable way until you do. And of course I oblige. They’re so good at annoying, though, PT. They’re profssionals. Do you ever get used as a public footpath? It was our old cat’s favourite trick. Only the English! I love it. I wonder if he ever had another called Podge? btw – do you think my updated Easter Bonnet Sonnet is improved or not? No option; the hat isn’t the same as two years ago. Alas, Col, I am late! But I have been keeping up with your blog entries. The Ode is my favourite this week, though the response to Side View’s theme is ingenious. That one is truly ode-ious! I love the tour and the photos but that spiral staircase is a bit vertigo-inducing. Looking forward to when you visit the other houses. Has Clive tasted oysters yet, even though the price has increased significantly since Johnson was procuring them for Hodge to slurp? They’re a buck a pop at a watering hole I frequent near The Grind; not to imply that the next time I get toasted I’m going to mail you a few for your feline friend. I do not forsee Clive tasting oysters as recession continues to bite, Lame; and Clive has odd tastes anyway. He seems to like some very strange things for a cat. Curry, for example. An excellent response to The Question. I do think our cats – and dogs – do rule our life rather than the other way around. In exchange, we get unparalled affection/ Enjoyed your story, Kate. That affection is priceless, isn’t it , Judy? Thank you! I like the look of his house . . . and his Hodge. Our previous cats, Jazz and Cayenne, took a fancy to lobster. They didn’t have the opportunity to indulge often. What a wonderful space…thank you for a step back in time. I shall be curious as you explore the rest! Pleasure, Angela. I’d love to live in a place like that. That attic! I’d like to go meet Hodge myself. I love the oyster shells at his feet. And the house seems so serene. See, that’s the advantage of a dog, They wouldn’t dream of walking all over the pack leader. I think it’s wonderful that Hodge was immortalized in such a fashion! And a well fed cat at that! I didn’t know that oysters were once the food of the poor. I learn so many things from your posts, Kate. What a grand tour. I can picture Johnson pouring over his books. I would love such a room for my piles to accumulate in and then a light-filled place to study them! So would I, Debra. I took one look at that beautiful space, with its view over the square, and coveted it immediately. They have Hodge beautifully captured, don’t they, BB?